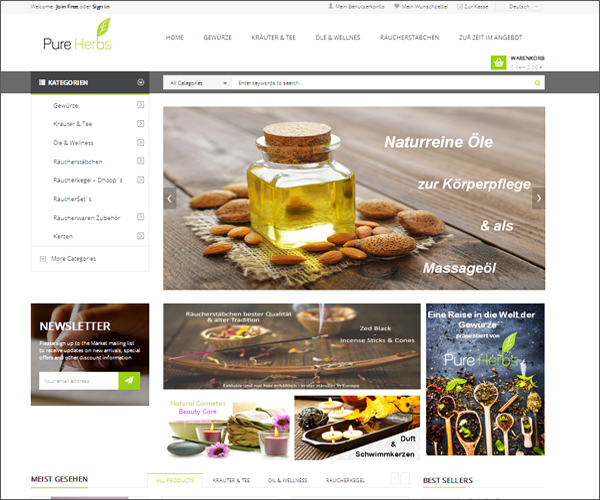 Pure Herbs is a Magento based eCommerce website developed by WebGuru. Our experienced team of qualified Magento developers has created a consumer focused eCommerce experiences to maximize online potential of the business that specializes in selling spices, herbs and tea, oil, wellness products, incense sticks and accessories, candles and cones. We believe that a sound technology platform along with ideal user experience can yield higher profits by delivering positive results. Our Magento website development solutions, based on a superb flexible platform offered the website owner of Pure Herbs the tools to develop the website into a profitable and highly visible selling portal. .
For Pure Herbs, we have developed a complete Magento eCommerce based online shopping cart that gives total control to the store owner without producing any restraints whatsoever on the business flow or the procedures involved. . Excellent shopping cart with improved usability by WebGuru! Such a Magento based website will surely allow customers rapidly add items to cart, without interrupting the shopping process. Thanks to share nice post———————–!